As my helicopter lifted off from the outskirts of Dawson City, I had no idea what to expect from my flightseeing tour of Tombstone Territorial Park. The scenery around Dawson City was nice- big hills, forests, and rivers- but the name Tombstone hinted at something far more dramatic. Staring out the window, I watched as the landscape below me gradually changed from forested hills, to alpine tundra. Dull yellows and greens sparsely covered the windswept brown and black mountains. It was a curious landscape, more intriguing than conventionally beautiful. 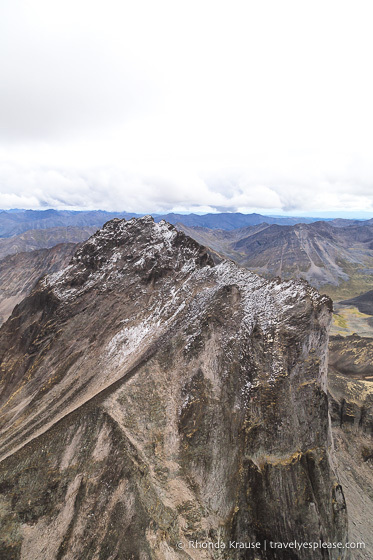 Flying further into Tombstone Territorial Park, the slopes became steeper and rockier, transitioning from rounded, rusty brown tops, to rugged grey and black peaks. Shifting my attention to the front of the helicopter, I could see the most perfect, jagged mountain, its skinny, elongated top reaching up into a fine mist of cloud. Life seemed to switch into slow motion as I open-mouthed stared at this powerful mountain. I couldn’t even form a proper thought as a soundtrack of “wows” played on repeat in my mind. Snapping back into the moment, I thought the pinnacle of the tour had come and gone. No. Things were just getting started. My helicopter pilot swooped us around a few more jagged peaks of the Tombstone Range before revealing Talus Lake and the unbelievable Tombstone Valley. As my pilot set the helicopter down on the polychrome landscape, I already knew that however much time he was going to give us here, it would never be enough. “How much time do I have,” I asked while opening the door. “Oh, about 20 minutes,” the pilot replied. 20 MINUTES! I almost choked. Eager to explore, I jumped down from the helicopter. As soon as my feet hit the ground I knew this place was unlike anywhere I’d been before. The terrain was spongy and bouncy, like walking on marshmallows. Delicate plant life hugged the ground and I felt a twinge of guilt as I hurriedly tiptoed around them the best I could to get a closer view of Tombstone Mountain. The scene in front of me was so flawless and alluring, I felt like I had accidentally walked onto a movie set. I felt torn, unsure where to focus my attention since every direction I looked was equally stunning. “15 minutes!” the pilot warned. I turned and headed towards Talus Lake, knowing full well I didn’t have enough time to get there. At least I could take pictures of the mountains. No path to lead the way, I was tripped up by shrubs as I attempted to skirt around them, running on the springy ground. I could feel my heart beating as I quickly looked for different photo angles, hoping what my camera captured was as incredible as what I was seeing. “5 minutes!” the pilot yelled. I rushed back through the shrubs wanting to spend my last few minutes admiring the classic view of Tombstone Mountain. I pictured myself skipping through the valley, not a care in the world. I knew I wanted to come back. Maybe next time on a hiking trip, when I wouldn’t be rushed. Free to sit and enjoy the view as long as I desired. I made my way back into the helicopter, reluctant to leave but excited to see more aerial views of Tombstone Territorial Park. I was transfixed by the vibrant mountain lakes, craggy summits, and striking rock formations. It was all so unexpected, nothing like what I saw in Dawson City. Looks like a gold-plated valley! Leaving Tombstone Territorial Park behind, I watched the mountains change from jagged to smooth, grey to copper-tinged, until soon we were back over flat ground. As my helicopter touched down in Dawson City, I was filled with gratitude to have seen such a special place. There was no doubt about it, this flightseeing and landing tour of Tombstone Territorial Park had cemented itself as the top moment of my week in the Yukon. 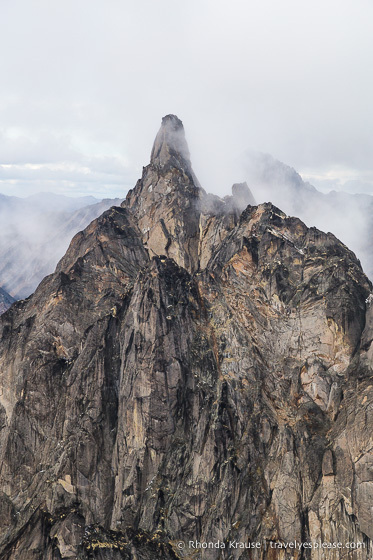 If you do this helicopter tour of the Tombstone Mountains make sure you have a lot of space on your memory card because you’ll want to take a ton of photos! If you enjoyed this post, check out these other incredible flightseeing tours in the Yukon. Tour Provider: My Tombstone Mountain flightseeing tour was with Trans North Helicopters, located at the south end of Dawson City along the Klondike River. Flying time was an hour. Photography Tips: I got the best photos from the front seat, shooting through the small part of the window that could be opened. Don’t stick your camera too far out because the wind will make it vibrate. If you have no other option but to shoot through the glass, try to position yourself so reflections are minimal. Getting your lens as close to the window as possible helps minimize glare. Also, make sure you are using a very fast shutter speed to get sharp pictures. For your convenience, here is a list of hotels in Dawson City. Please consider booking your Dawson City accommodations through the included link. It costs nothing extra and helps support this website. Thank you! I visited the Yukon as a guest of Tourism Yukon. As always, I speak only the truth and hosts have no editorial influence on articles.